The 21st World Congress on Neurology and Therapeutics is to be held during March 15-17, 2018 in London, UK. Neurology Conference will be organized around the theme “Exploring the Recent Innovations and Novel Therapies in Neurology and Neuroscience”. 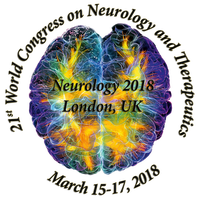 Neurology 2018 invites participants, moderators, and exhibitors from everywhere throughout the world to London, UK. The 21st World Congress on Neurology and Therapeutics is a unique forum to bring together worldwide distinguished academics in the field of neuroscience and neurology, Brain researchers, public health professionals, scientists, academic scientists, industry researchers, scholars to exchange about state of the art research and technologies. The Aim of this conference is to stimulate new ideas for treatment that will be beneficial across the spectrum of Brain Disorders.